Dare Wright never had any children of her own, and first borrowed me when I was a few weeks old. Delighted to rid themselves of a colicky infant, my parents decamped for the weekend, leaving Dare with their firstborn, some utilitarian baby garments, and an officially sanctioned bassinet. 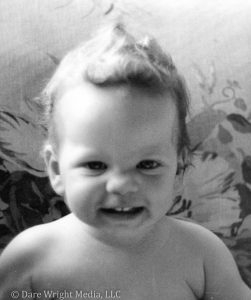 When they returned to claim me, they found their baby dressed in a handmade lace nightgown, sprinkled with cologne, and welcoming them with a beatific smile. I asked Dare many years later how she had worked the transformation. Dare was patient, creative, intuitive, and often seemed more of a fairytale wood sprite than a flesh and blood person. 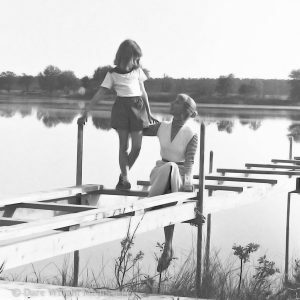 It was an intoxicating combination to a child, and I delighted in pretending Dare was my mother. 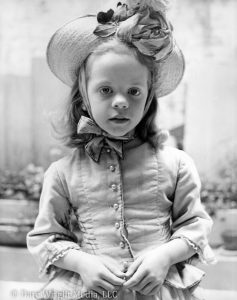 As a child actor in New York, I spent my days juggling a career with attendance at a Dickensian girl’s school. 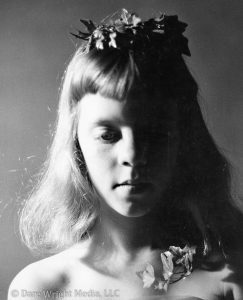 It was exhausting, and a series of photos that Dare took of me show a pale child with dark circles under her eyes. 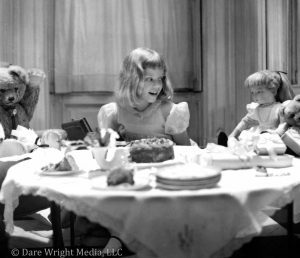 To surprise me on my eighth birthday, Dare set up an elaborate party in her apartment with Edith and the Bears as the invited guests. The table was set with antique pink floral china and filled with elegantly wrapped gifts. Dare made my favorite chocolate cake, and we cut slices for both animate and inanimate attendees. That night, we curled up in Dare’s bed inventing pirate stories with buried treasure. I asked Dare if she thought there might be a treasure map hidden inside Folly, her Victorian wooden horse. “Let’s investigate!” said Dare, leaping from the bed. She grabbed a knife and we dug a small plug out of the antique steed. There was no treasure map, but it didn’t matter. Dare’s willingness to enter into my fantasy was reward enough. 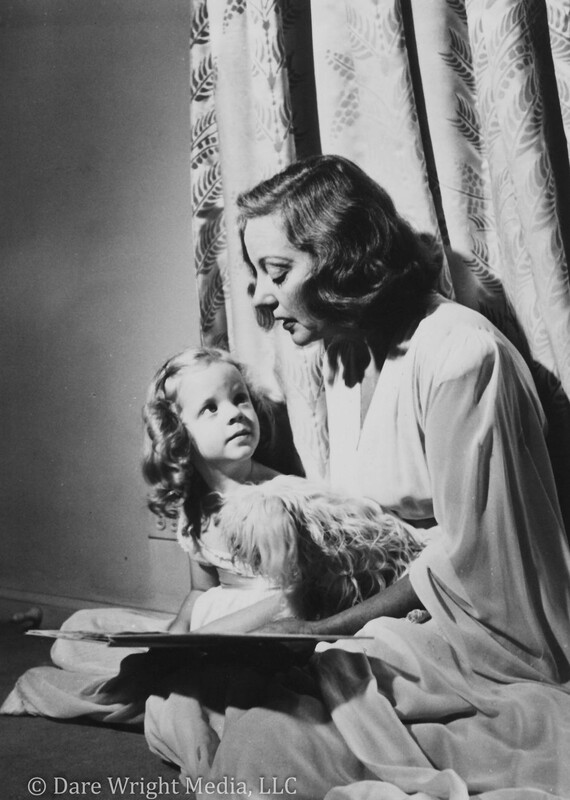 Dare and I often spent weekends with my godmother, Tallulah Bankhead, and Dare’s photographs captured a rare glimpse of Tallulah’s maternal side. Working with Dare was a delight. 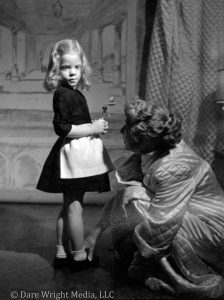 Long before Dare rediscovered her Edith doll, she was dressing me up in a handmade dress and white apron. Her mother, Edith Stevenson Wright, painted my portrait in the outfit. Dare photographed me often on the terrace of her apartment where she staged much of The Lonely Doll. Dare also let me write my own stories, which she photographed and bound into books just for me. 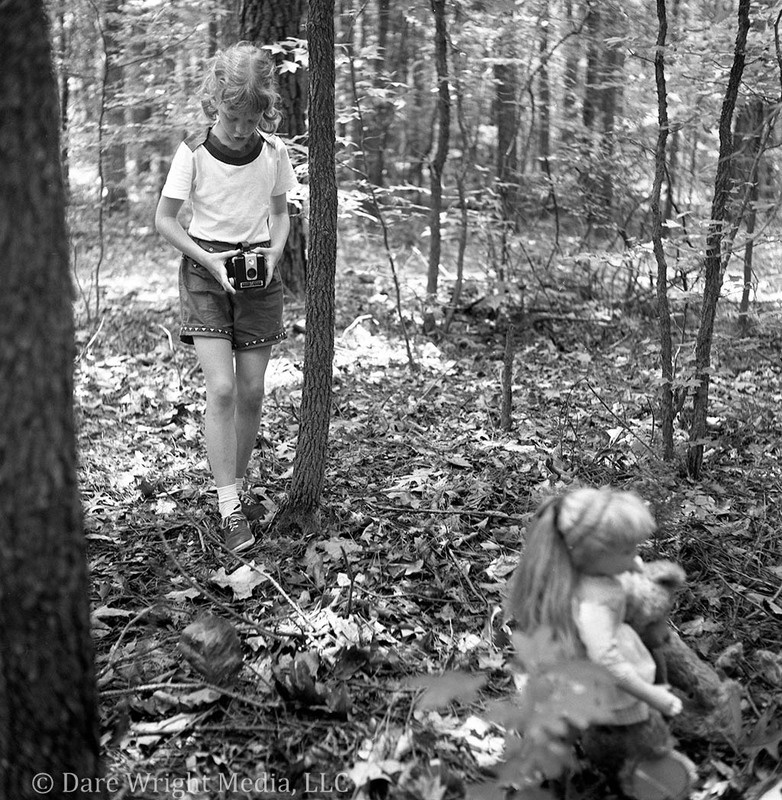 The Angel and The Doll starred Edith and me as naughty angels, A Walk in The Woods was a drama where Little Bear fell asleep in a tree, and The Great Camera Mystery had Mr. Bear wondering who was borrowing his valuable camera and taking photographs of noses. What touches me greatly is that Dare let me set up the shots and arrange Edith and the bears however I wished without any interference. Any other adult, even without Dare’s talents, would have adjusted the doll and bears into more photogenic poses. 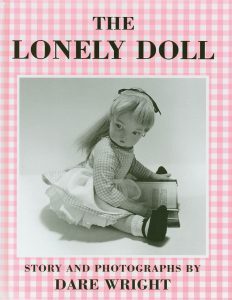 In the mid 1950s, Dare and I began collaborating on a story line featuring Edith and the Bears that would, through many iterations, turn into Dare’s 1957 best-selling children’s book The Lonely Doll. In the hundreds of photographs Dare took, along with the two mock-up texts she wrote and pasted together, the central theme emerged. Edith, The Lonely Doll, found her forever family when Mr. Bear and Little Bear turned up unexpectedly in her garden. 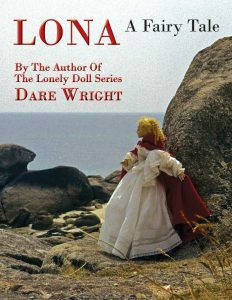 It didn’t matter where they had come from or that they were an entirely different species from the little child doll. And although Edith and Little Bear got into various forms of mischief that tried Mr. Bear’s patience, the love between the unlikely trio was absolute, and they promised to stay together forever. 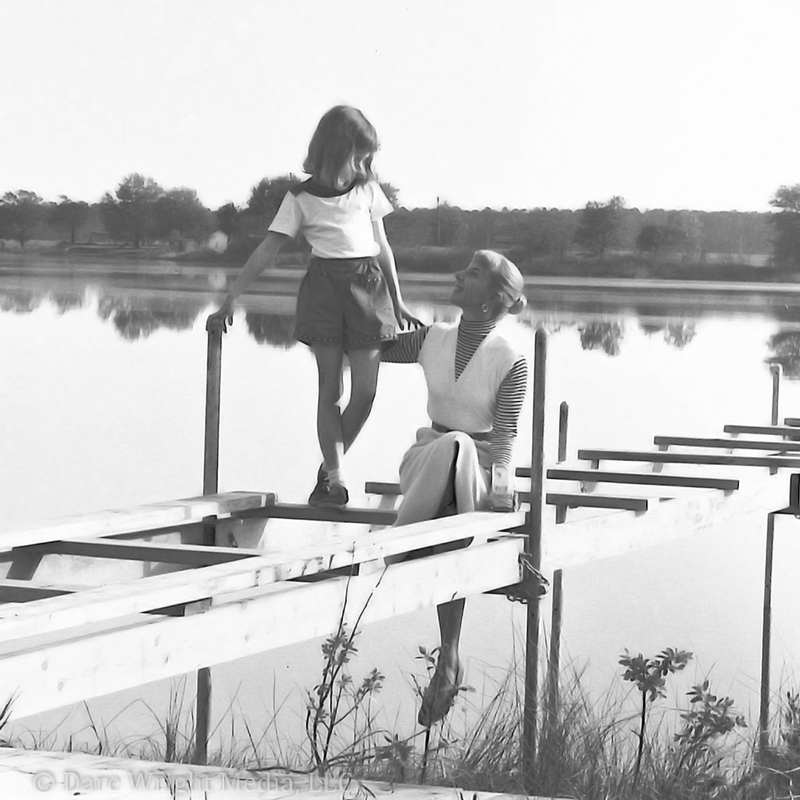 As I grew up, Dare chronicled my teenage years. She dressed me as everything from an ethereal nymph to a swinging sixties schoolgirl. My daughter, Brett, was featured in Dare’s book, Make Me Real, for which she was photographed with Dare’s childhood bisque doll, Persis. Watching Dare lovingly pose Brett brought back memories of my own photo sessions with her, and I came away with a new, adult’s perspective on Dare’s magical connection with children.